Aspiring Model In Photo Shoot Fail ... Drone to the Face!! Here's how brutal it is to break into the biz -- an aspiring model/actress is lucky she still has eyes, ears and a nose after a 4-prop drone smashed into her face during a photo shoot. Jess Adams was helping a photographer friend Saturday with a clothing shoot in Malibu. Jess, who's appeared on "Community," says it was her first time working with a drone. It had all the makings of a perfect shot ... on a rocky bluff, waves crashing, the wind blowing and what Jess says was her "seductively eye-f******" the drone camera lens. And then ... WHAM!! Jess doesn't think it was a piloting error ... rather the drone rode a gust of wind directly into her face. She suffered a few scrapes and bruises, but still got checked out in the ER. Jess is handling it like a champ, saying ... "If you're gonna get hit in the face with a drone better at least be able to watch it and die laughing." 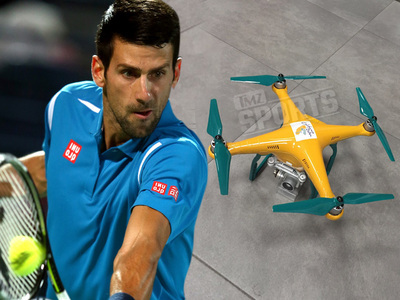 Novak Djokovic -- Forget Cars ... I Pimped Out My Drone! !